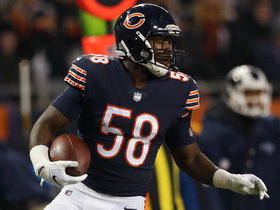 Analysis: Smith started a bit slowly after holding out and fighting through a hamstring injury, but after the Bears' Week 5 bye, he quickly proved that he was the elite player the team expected to see after investing a top-10 pick on him in the 2018 draft. He'll enter the second year of his rookie deal in 2019, and fantasy owners should expect him to be develop into a star in both a real-world football sense and as an IDP asset. Analysis: Smith has tallied at least nine tackles in four of his last five games which has given him a fantastic weekly floor, and the five sacks he's added give him an excellent weekly ceiling. 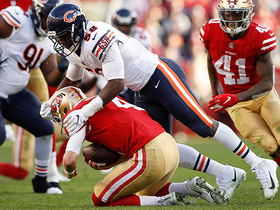 Analysis: The rookie has been a superstar since the Bears' Week 5 bye, as he's reached double-digit tackles six times while adding three sacks and an interception. He'll continue to be a weekly auto-start IDP with elite upside. Analysis: Even though Smith's six tackles represented his lowest total in six weeks, he continued to be a stellar IDP performer by picking off a Jared Goff pass. Even as a rookie, he's become an elite fantasy option who still has room to improve. Analysis: Smith has collected double-digit tackles in four of the last five games, and he's been a strong fantasy contributor since Chicago's Week 5 bye. 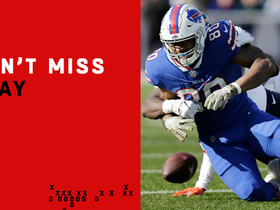 Analysis: As he's done for much of the last month, Smith was making tackles all over the field, including dragging down Kenny Golladay after a long reception on his way to posting double-digit stops for the third time in four games. He also sacked Matthew Stafford -- giving him three sacks in his last six contests -- and it looks like the rookie has emerged as a high-level IDP. Smith notched a sack and 10 tackles in Chicago's Week 10 victory over the Lions. Analysis: Smith collected double-digit tackles for the third time in five weeks in addition to picking up his third sack as a pro. Since Chicago's Week 5 bye, he's become a must-start IDP with excellent upside. Smith tallied 13 stops in Chicago's Week 9 victory over the Bills. Analysis: After a slow start to the season, Smith has now posted a pair of 13-tackle performances along with one sack over his last four games. He's quickly emerging as an impact IDP who should be owned in most leagues, especially as he continues to improve throughout his rookie campaign. Smith recorded a sack and five tackles in Chicago's 38-31 loss to New England. Analysis: Smith was able to notch his first sack since the season opener as he put together his second-straight strong fantasy performance. Despite his encouraging effort, he's yet to put together the type of consistency to make him more than a streaming option in IDP leagues. 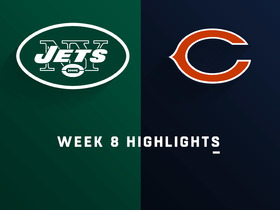 Smith recorded 13 tackles (six solo) in Chicago's 31-28 loss to the Dolphins. 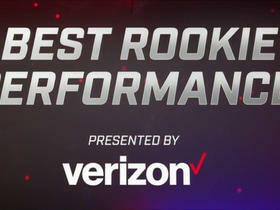 Analysis: Smith led the Bears in tackles by posting the best fantasy performance of his rookie season. Coming into this contest, he had just 18 tackles in four games, but his production will likely ensure that he'll be added to many fantasy rosters in the upcoming week. Playing in the middle of a loaded defense certainly could provide Smith with the potential to become a weekly IDP starter. Smith is listed as a starter for Monday's game against the Seahawks, Adam Hoge of WGN Radio reports. Analysis: Smith recorded one sack and three tackles in his first regular season game against the Packers despite playing limited snaps. The rookie first-round pick looks poised to establish himself as a key cog in a Bears defense that boasts tremendous talent up front. Smith collected a sack and three tackles in Sunday's loss to the Packers. Analysis: Smith is still working his way into game shape after missing time with a hamstring injury, but he was able to post the first sack of his career. With Khalil Mack in the fold, Smith may be able to add a solid number of sacks to what should be strong tackle numbers, especially since offenses will be forced to game plan around the former. Smith (hamstring) wasn't listed on the Bears' Week 1 injury report Wednesday, Colleen Kane of the Chicago Tribune reports. Analysis: Smith has been limited for about three weeks due to a tight left hamstring, missing the final three games of the exhibition slate in the process. With a full practice finally under his belt, he's trending toward an appearance Week 1, but it remains to be seen if he'll be inserted into the starting lineup immediately to begin his career. Bears coach Matt Nagy indicated that Smith (hamstring) had a good practice Tuesday, but he also said he will likely miss the team's preseason finale Thursday against the Bills, Rich Campbell of the Chicago Tribune reports. Analysis: Smith missed Saturday's preseason game against the Chiefs as he continues to recover from the hamstring issue. While it sounds as though he may be getting close to returning to game action, the Bears have little incentive to push him into a preseason game with the regular season on deck. Smith (hamstring) is being held out of Saturday's preseason contest against the Chiefs, Kevin Fishbain of The Athletic reports. Analysis: Smith has yet to see action this preseason due to a holdout earlier in training camp and now a hamstring injury. The 2018 first-round pick will hope to get some snaps in the Bears' final preseason game against the Bills to avoid entering his first NFL campaign with no prior professional experience. Smith (hamstring) is not expected to play in Saturday's game against the Chiefs, Rich Campbell of The Chicago Tribune reports. Analysis: Smith has only practiced with Chicago six times since his training camp holdout ended, and he's been limited due to his hamstring injury the past couple days. The team hasn't officially ruled him out for Saturday's contest, but it would be a surprise to see him suit up. He'll have his eyes on the team's preseason finale against the Bills next Thursday for his Bears debut. Smith (hamstring) participated in position group drills during practice Wednesday, Colleen Kane of the Chicago Tribune reports. Smith left Tuesday's practice due to tightness in his left hamstring, Rich Campbell of the Chicago Tribune reports. The Bears and Smith agreed to a four-year contract Monday, Adam Schefter of ESPN reports. Analysis: The waiting game is finally over with the Bears' 2018 first-round pick. Slotting in as one of the starting inside linebackers, Smith will take on a three-down role immediately, which should keep him relevant in IDP formats from Week 1 onward. Smith is holding out to protect his guaranteed money in the event he's suspended due to the league's use-of-helmet rule, Patrick Finley of the Chicago Sun-Times reports. Smith still hasn't signed a contract and won't report for training camp Monday with the rest of the Bears' rookies, Ian Rapoport of NFL Network reports. 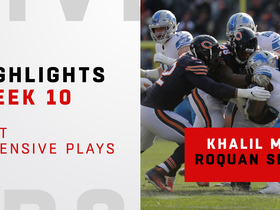 Check out all of Chicago Bears linebacker Roquan Smith's best plays from the 2018 NFL season. Chicago Bears linebacker Roquan Smith flies in untouched off the edge for the sack. 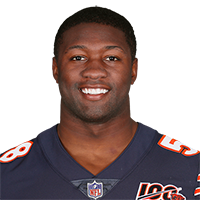 Chicago Bears linebacker Roquan Smith grabs his first interception in the NFL on Los Angeles Rams quarterback Jared Goff. 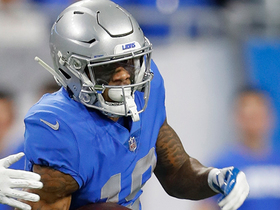 Detroit Lions wide receiver Kenny Golladay gets free on the outside and breaks down the sideline for 43 yards. 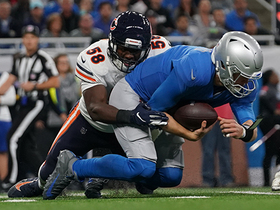 Chicago Bears linebacker Roquan Smith blows past a block by Detroit Lions running back Theo Riddick and sacks quarterback Matthew Stafford. 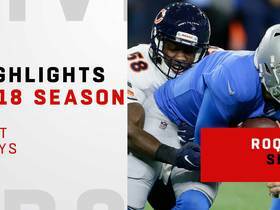 Watch the best plays from Chicago Bears linebackers Khalil Mack and Roquan Smith. Chicago Bears LB Roquan Smith had a terrific performance in Week 9 of NFL action. 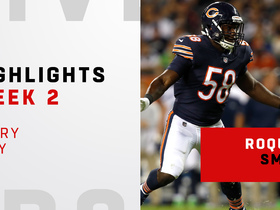 Watch every defensive play from Chicago bears linebacker Roquan Smith in his Week 2 match up against the Seattle Seahawks.